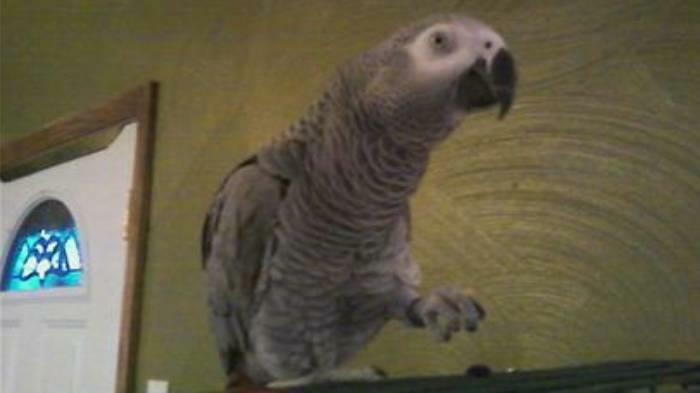 I had the pleasure of living with a Congo African Grey for six years. He still lives with my mom to this day, so when she heads out of town I am the lucky one that gets to pet-sit him. His name is Haru, and he has added joy, humor and a little bit of trouble to my mom's household. African Grey's are extremely smart, sometimes for their own good. Haru is an extremely big talker. He has a great vocabulary, and he says a variety of words and phrases. Haru also mimics the voice in which it was said in (Example - he use to yell "mom" in both mine and by brother's voice). He calls the other animals and will whistle just like a human. He will greet you with a "Hello, how's it going?" and at night he loved to say, "Night Ru." Haru could be quite entertaining and I always enjoyed his company. However, not everyone is a fan of this type of a bird. African Grey's can be a tough pet if you don't have the patience to work with them and understand their habits. My brother and my husband are scared to put their hand in his cage. To this day, only my mom and myself can do it without Haru wanting to bite an unfamiliar hand. If he does bite you then "OUCH" is all I can say. There is a way to get out of this strong beak grip, but the sting of his bite alone is enough to bring a grown man to his knees. Work with them and get them use to you before you just stick your hand in their cage. African Greys are smart (I repeat, SMART), so they can sense your fear of them too. In retaliation of this fear, they go on the defense and will bite to protect themselves. Please warn all visitors of this before they go to 'pet' one. You MUST watch you feed them. Certain foods like avocados and other fruits can be deadly to an African Grey. I recommend buying a book that lays out what outside foods you can give them. Haru was never a big fruit eater, so his diet really only consists of normal bird food that is made for an African Grey. We also never clipped Haru's wings. We let him fly free around the house sometimes, so he could get some exercise and stretch. My mom had heard stories of African Greys trying to fly after getting their wings clipped, only to crash and break some ribs because they were use to flying and didn't realize that their wings would not support them. In contrast to that, I am friends with a couple whose African Grey gets her wings clipped regularly, and she has had no problems. This African Grey actually sits outsides on her perch while the two of them work in their garden. They have no fear of her flying away because she is not able to. To each other own on that one - just let it be a choice you stick to and not flip flop on. My biggest recommendation is to not go into getting an African Grey without doing some research on them. They can be a lovely pet, but if you don't have an interest in talking or working with them, then do NOT get one. If you do get one and take the time to understand it, you will find that they can be a wonderful pet (even with the throw up).